For we know that if our earthly house of this tabernacle were dissolved, we have a building of God, a house not made with hands, eternal in the heavens. For in this we groan, earnestly desiring to be clothed upon with our house which is from heaven: if so be that being clothed we shall not be found naked. For we that are in this tabernacle do groan, being burdened: not for that we would be unclothed, but clothed upon, that mortality might be swallowed up of life. Now he that hath wrought us for the selfsame thing is God, who also hath given unto us the earnest of the Spirit. Therefore we are always confident, knowing that, whilst we are at home in the body, we are absent from the Lord: (for we walk by faith, not by sight:) We are confident, I say, and willing rather to be absent from the body, and to be present with the Lord. 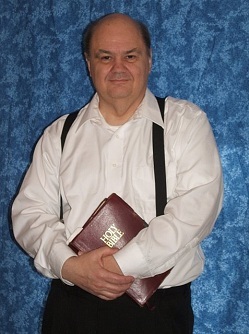 For the past twenty-nine years, my husband, Pastor David J. Meyer, has faithfully researched the events of the day, and with the help of our God and His undisputable Word, he brought to us the Last Trumpet Newsletter each month. Many of you have fostered this ministry by your contributions and prayers. He has been encouraged greatly through your kind and informative letters. He met many of you in person, even baptizing some of you and ministering in any way possible. Pastor Meyer also gathered with our prayer teams each Saturday evening and helped us pray for your prayer requests. He felt a love and a burden for this work, and the newsletter was always written with the great desire that eyes would be opened to the cunning ways of the devil and his cohorts. It was hoped that his readers would learn to see through the deceit and the manipulations of the enemy and realize that there were those with less than noble purposes that strive to control the masses. Most of all, Pastor Meyer wanted his readers to realize that the return of Jesus Christ was at hand and that the signs on the earth and in the heavens were ordained by God and declared the times. Ultimately, God is in charge, and if we cry out to Him in repentance and obedience to His Word, He will hear us, save us, and deliver us from this present world of sin and death. Pastor David Meyer's perspective was unique. God had saved him from out of the world of the occult in 1969. He was young then, only 19 years old when God called him, but as a teenager David had already gathered a following with his astrological keenness. Sitting on the steps of his back porch, he would invite spirits to come into his person. He amazed people by writing out their horoscopes and making predictions that came to pass. When David accurately told strangers their birthdates, they were stunned. Certainly, if God would not have intervened in his life, his story would be completely different. But thank God, there was a complete and true conversion. God turned his life around and used his past to edify and instruct His people. Because of his background in that other world, David had insights into the workings of the kingdom of darkness. He threw a dagger into the devil's realm so that God's people could be aware of the devices of the destroyer and the sinner would feel the need to repent. In June 1981, my husband, Pastor David Meyer, felt compelled to begin the writing of this newsletter. I remember some scoffers who laughed at his new project, but no one could then imagine the impact that this new project would soon have. We sent it out to two hundred individuals in our local telephone book. One young man who read the newsletter sent out a copy to another publisher. The publisher liked my husband's materials and reprinted his article, and soon to our great surprise, we were getting responses from many different places. Soon it spread to Norway and Japan. In a short time, we were getting letters from most of the fifty states here in the United States, and we also began hearing from people in Europe, Australia, and Africa. Each reader had a story, and we began to realize that the Lord was using the Last Trumpet Newsletter and spreading it around the world. We thanked God for such an opportunity. Financially, our ability to begin this newsletter and continue it was a miracle. With the birth of our fourth child, Rebekah, and the needs of a growing family, supported by a small church and an infant locksmith business, money was not in abundance. However, God always granted us the funds we needed to print the newsletter and keep it circulated. One time, Pastor Meyer was heading to Madison, Wisconsin, to the printers with the newly written monthly newsletter. He didn't have the funds to cover the printing cost so the printers had graciously agreed to extend credit for this printing. However, before my husband left town, he looked inside the mailbox. There in the mail were two envelopes, and inside these were the exact amounts needed to pay for the printing! From that time forward, the funds needed to publish and mail the newsletter were always supplied. We never had to beg or charge a fee even though we were mailing it all over the world and also sending it to many inmates. In time we started offering tapes, CDs, and DVDs. Staff members to work the ministry were added. The Lord helped us to buy Faith House, and more recently we leased a processing center to facilitate our needs to do this work. Our ministry was extended over the internet. Always, the Lord has provided and kept Last Trumpet Ministries alive. Our family would like to thank all of you for your support through the years for our ministry. Your recent outpourings of love and condolences have touched our hearts. Though we grieve the loss of our beloved pastor, friend, father, grandfather, brother, uncle, and my husband, who went home to be with the Lord Tuesday, June 8th, 2010, we know we shall meet again. This time we will meet in that place where there are no more seas, or boundaries. In that perfect place, there will be no more tears, no more death, neither sorrow, nor crying, or even pain. The former things will never come to mind for we shall dwell with God in His very presence. We will know each other and long enjoy the work of our hands as we worship together around the throne of God for eternity! My dad sang for us a lot when we were little. Some of my earliest memories are of my dad coming into the room I shared with my little brother, Nate, when I was four or five years old. Besides the lullabies, he spun the most delicious bedtime stories: vivid, original tales that I suppose no other children ever had the chance to hear. He would pray for us, then tuck us in, lifting the blankets up, up into the air four or five or ten times and letting them settle all around us, soft like a parachute floating down. The songs were always a family affair. He would attract our ever increasing brood all around him whenever he brought out his concertina. It was a shiny red contraption with white buttons, a whole arm's length when it was completely unfurled, cheerful in its breathy huffing as it was pulled and pushed into bright melodies while he sang for us-- everything from "Mrs. Murphy's Chowder" to "Der Fröhliche Wanderer." My dad sang in the shower. He sang in the upstairs hall while we were getting ready for church. He sang anywhere the mood struck. Of course, nobody minded. He had a nice tenor voice and perfect pitch. I can still hear him singing now. Sometimes when my heart needs lifting, the little melodies he recorded there play on and on for me. Over the past few days since he has passed, I have been hearing one in particular. I cannot convey the sound of his voice in these paragraphs I'm typing, but I will pass along the words to you. It may be you will cherish them in your heart as I do in mine. Why do you let the troubles of tomorrow / Bring sorrow to your heart, and burden too? For if the Father's eye is on the sparrow / Then surely He will care for you! He knoweth, and careth / Each burden, He beareth / For if the Father's eye is on the sparrow / Then surely He will care for you! It's a child's song, but then Jesus did tell us we should all be just like little children when it comes to trusting in God. Whatever economic maelstrom, whatever political or social injustice may exist, small children don't fear or fret over the future. They trust without a second thought. So do the sparrows. I have yet to see a sparrow furrow his feathery brow in despair of any kind. He just goes about his day, chipping and fluttering, oblivious to human drama. So this is the legacy I value most from my dad: his counsel to trust implicitly in the Lord. All Christians have been entrusted to continue the work of Jesus Christ on earth as His hands and His feet and His voice. This is our simple mission as long as it is yet our time. We have everything we need to fulfill this commission as we allow the words of Jesus to rest in our hearts: "Peace I leave with you, my peace I give unto you: not as the world giveth, give I unto you. Let not your heart be troubled, neither let it be afraid." A couple months ago, I remember mom calling me to ask when I was available to fold the newsletter. "He wrote it?!" was my stunned reply. Almost immediately, I felt foolish for being surprised. True, the last time I had visited him since the surgery he could hardly stay awake for five minutes at a time. But this was the newsletter we are talking about, and the saying "If there's a will there's a way" never rang so true. And with dad there was always a will. He was so determined! For almost thirty years he wrote the newsletter, and for much of that time he had two other jobs! Working forty hours a week as a locksmith at UW Oshkosh, plus over an hour and a half driving each day, was his routine. And I can recall many times waking in the middle of the night and hearing dad leave for work because some student put gum in a lock! Yet still, there was church three times a week, plus Bible studies with other groups, sometimes on a weekly basis. He always joked that he wasn't a "Noted Preacher" because he didn't use notes. Well, that was a good thing, because I really don't know from where the time to write them would have come. And then there were the phone calls! All the time, people needing help or just wanting to talk to him would call. We grew up with the best human role model I can imagine. In terms of qualities that define us, I look at his level of devotion as something amazing! To mom, to us kids, to the newsletter readers, to the church family...dad made time for everybody, leaving very little for himself. Sometimes I catch myself actually thinking that I'm busy, and then I think of him and feel silly. He may have lived only sixty years, but I think it would take triple that for most of us to do all that he's done! Even with most of his time spent, he was a fun dad! He always had a joke. When I first was called with the news that he wasn't doing well, I was in an awful state...crying and completely panicking. When I gathered myself somewhat, I called work to tell them that I wouldn't be in. In the middle of trying to choke the words out on the recording, I thought of something dad used to joke about. He sometimes threatened to call in and say, "I've got foot trouble; I can't stand to be there" or "I've got eye trouble; I can't see coming in!" I let out a mini-laugh in the middle of the recording...it must have been quite a strange sounding recording... But that's how it's been. Dad still makes me feel better when I think about the funny stuff he said! I guess in a way the limited time we got to spend with him was a blessing because being with him always seemed like a treat! Sometimes he would join my brother and me for part of the Packer game. Truth be told, I don't really think he cared about the game too much. It was just his way of relating to us, and we knew it and deeply appreciated it. I think that was true with all of us kids; he found some way to relate to each of us. His ability to relate to people in general was something I always admired. He would meet someone, and it seemed, whatever subject came up, he knew something about it! It could be some random thing that I had never even heard of. Yet he would be able to talk about it and thus relate to that person. As a result, he seemed to know everybody, and it kind of felt as though our dad was famous. I worked with a lady once who upon meeting me asked if I was related to David Meyer. I of course told her that he was my father. She then explained that he had done some lock work for her some nine or ten years ago. Still she remembered him well enough to recognize him though me! There are two things in this life you can spend: money, and time. While you can always earn more money, you only get so much time. But as with money, a wise man will invest his time as well. Dad did just that with all of his work for God. And I have to believe his investments are reaping huge returns! You're a tough act to follow, Dad! I love you. I miss you, and I will do my best to see you again! Life is too short. The things that really matter seem to get lost in the everyday monotony of life. There are so many things I wish I could say to my dad. I wish I could tell him how much I admire him for his strength, his kindness, his honesty, his dedication. I wish I could tell him that I treasure each and every memory that I have with him. He always made me feel so special. Even when I was naughty, I know it broke his heart to have to discipline me, but he loved me enough to do it. I know that he always wanted the very best for all of his children. I wish that I could find the words to express how much I love my dad. He made everything better; he made everything special. The lessons we learn in life aren't from a textbook. And as I think about all the memories we shared on the rare occasions when it was just my dad and I, I realize that it wasn't the actual event that mattered. It was the way that what we had done made me feel. He showed his love through actions; thus I learned that love is a verb. It is in the doing. We do not live this life for ourselves, and dad definitely never thought of just himself. He thought about me, he thought about you and everyone else. He always put God first and set an example for everyone. I thank God for the time that He lent him to us. I miss him, but it is beautiful to know that he is with Jesus, and I will see him again. While I was growing up, my dad was the hardest working person that I've ever seen. He was a pastor, he was a locksmith for a college, plus he had his own business. Mostly though, he was our dad. No matter how he felt he worked from dawn till late into the night just so that he could make sure that his children were taken care of. One of the most important things to me was to never disappoint him. I always strived to make my dad proud of me. When things went wrong, I always worried that I would hurt him by not doing well. The truth was that no matter what we did he still loved us; he was always proud of us. He taught me how to be a good person. He taught me that you had to work hard, love each other, and help whenever and however one could. Most of all, he prayed for each and every one of us daily, and I know that is what made us the people that we are. Some of my favorite memories growing up are very basic things. At night all eight of us kids would crowd into my parents' room, and my dad would tell us all stories of his childhood or just stories. Sometimes, he would sing. It was what I looked forward to everyday. For a while, I wanted to be a locksmith, just like my daddy. That was because one time when I was really little my dad took me on one of his lock jobs at Green Giant. He introduced me to the office personnel as his assistant. I had so much fun just helping him. My dad was a great father, a great man, and someone that we all learned from and loved and respected. My dad will always be part of me, who I am, and I will be a better person just because of him. When my father was born, the Lord inspired my grandmother, Alvina Meyer, to name the baby David, which means beloved, an appropriate name for one that would become very beloved by many. My father grew up in a little house, as one of nine children, and had few possessions, but the essentials were always provided by his hardworking parents. He was raised knowing the value of working hard, an attribute he also exhibited throughout his life. When my father began his ministry, he had it in his heart to never press people for money. His mission was to help others find their way to Jesus Christ. When he started a church, he took an additional job as a locksmith so he could provide for his family and help the church to become debt free. Likewise, when he started writing the Last Trumpet Newsletter in June of 1981, he again resolved never to charge or put a price on anything. He believed there was to be no buying or selling in the kingdom of God, only giving and receiving. He stepped out on faith and knew that God would always provide, even if it was at the last minute. This built a foundation of faith by which he lived his life. Being a father of eight children and working multiple jobs to support them, he was continuously busy. He taught science and history classes to home-schooled children, visited the elderly in nursing homes, managed the ministry, corresponded with many people throughout the world, held Bible studies, and did many other endeavors. He felt pressed to serve God by helping others. He regretted his early past when he had dabbled into occultism and felt deeply the need to expose the deception and corruption that he saw in the world. It became his incentive in life to honor God's will and to teach others to do the same. He desired above all else to reach Heaven and to help as many people as he could get there, too. His influence on others is astonishing. In forty years of ministry, he impacted thousands of lives. He will most certainly be missed. I can't look at anything in my life without realizing I have it because of him. Whenever I needed him, he was always there to help me. He encouraged my faith, taught me to put my trust in God, and always prayed for me. Because of him, I know the way I must seek is God's will, the journey I must take is to Heaven, and the greatest treasure I possess is the Word of God. I'm sure that there are many people reading this who at one time or another called upon my father, Pastor David Meyer, to pray for them. I can be sure of this because I sincerely believe that anyone who had ever heard my dad preach could not help but recognize his steadfast belief in the power of prayer. This is one of the things that captured my attention even as a young child, and it became one of the things I loved most about him, even to this day. I, along with some of my siblings, had the opportunity to travel with him and my mother on three or four different occasions. I remember watching as dozens upon dozens of people lined up after he had finished preaching, waiting for my dad to pray for them or a loved one. The power that flowed from his prayers was so evident that one could not even watch without feeling surrounded by the spirit of God. Sometimes it would last for hours, but my father would stay there without fail until the last person had been prayed for. After my dad's hospitalization in April of 2010, I felt compelled by God to assist him with the writing of the Last Trumpet Newsletter by offering to take dictation as he had lost eyesight in his left eye and writing was now harder for him. Even though I would never have imagined it at the time, the May and June 2010 editions of the newsletter would be the last he would ever write. In the writing sessions that we shared, my faith became stronger and I felt closer to God than I had ever been before. Even though my dad was so sick and in a great deal of pain, his faith never failed. Every day, before anything else, he would pray for wisdom and strength, and I will never forget the power that I felt and the faith that he portrayed, even in his weakened state. God used him until the very end. My dad often stressed not only the importance of prayer, but also the value of prayer. Having the opportunity to lay all things out before Jesus Christ and allowing Him to work them out according to His perfect will is an amazing gift, a gift that David Meyer cherished so dearly throughout his lifetime and encouraged all others to cherish as well. I look back on all the times that he prayed for me (which I'm sure are more than I could ever even be aware of), and I thank God for giving me a father with the faith to bring all things to the Lord. He was a kind and generous man, a loving and supportive father, a powerful preacher and prayer warrior, and a humble and devout child of God. His example is one that I pray will live on through many lives. There are so many things I could say about my dad. However, he was such a profound man that I am honestly lost for adequate words that are worthy enough. He was more than just my father. He was also my minister, one of my teachers, and even my employer. Knowing him in all these aspects has been truly a blessing. I will always cherish the memories of being with him and knowing him in all of these ways. There are times I wonder why it was his time to go home. Then I am always reminded of how God knows all and He has the whole world in His hands. He knows what is best for everyone because it is only He who knows what the future holds. We as humans can only do so much and last so long in an uncertain world such as ours. It is only God who knows what each of us can bear and when our time is over. This world offers much disappointment, but if we can truly live by faith, we can endure through the hope of Jesus Christ. He hears every cry and sees all that goes wrong, and if we hold on to Him, we will be able to understand everything in the end. He will make all things new. As for my dad, he is now in that place where everything is new and nothing can ever take it away from him. My father was a remarkable man. He was the hardest working, most generous, and most God-fearing person I've ever known. He freely gave of what he had to his friends, children, and even complete strangers. His faith in God was unshakeable, and with his daily prayers he truly prayed without ceasing. Dad was a hard worker. I remember watching him work and being amazed at what he was able to accomplish. He'd get up and preach every Wednesday and Sunday, spend days preparing and writing the newsletter, answer correspondence, manage nearly every administration aspect of the ministry, and even maintain our lock systems. Dad was a prayer warrior. I've never known another person who prayed as much as my dad did. If one of his children were sick, he would sometimes pray all night. So mighty and fervent were his prayers that you could feel the presence of God just by being near him. His intercession before God truly wrought many blessings for his family, his congregation, and people all over the world. Dad was a great boss. He was never overbearing and didn't enforce rigid procedural policies. All he really cared about was getting the Gospel message to as many people as possible. So as long as we got our work done, he was happy and rewarded us generously for it. Dad was a humble man. He truly believed that without God's help, he could do nothing. He didn't place much value on material things; his most prized possession was his Bible. He didn't own fancy suits, buy luxury cars, or live in a big extravagant house. In fact, I would sometimes grow frustrated with my Dad because he'd so seldom "splurge" and buy things for himself. Dad was a great dad. It's not easy being a parent these days, especially when you have eight children. But if any of us ever had a problem, he would drop what he was doing and come help us. If I needed advice, he was always there for me. If one of my siblings had a financial crisis, he'd do what he could to take care of it. He loved to give us good things even though we didn't deserve them. I rejoice that my beloved father and pastor, David J. Meyer, is now in Heaven. But I miss him greatly and eagerly await the day I get to see him again. It was Pastor Meyer's wish that we continue his ministry, and if we are able, we will endeavor to keep you all up to date on the happenings around the world in these last days. We humbly ask for your prayers, seeking the Lord's guidance and perfect will, as we move forward. As usual, you may continue to send us your prayer requests, and our team of intercessors will give them each individual attention. Grace and peace be unto you in the name of the Lord Jesus Christ.